Cook the pasta and drain. Set aside. Add the diced onion and cook until soft. Slice the sausages into thin circles and add to the onions, along with the garlic and chili flakes. Cook over a medium-high heat until the sausage is cooked through. 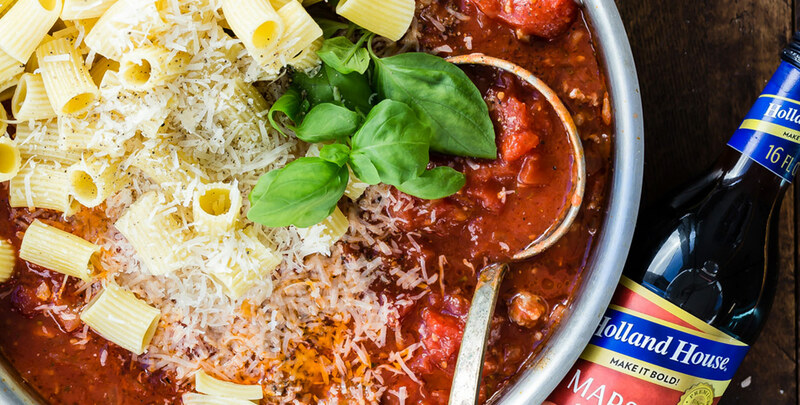 Add the tomatoes, tomato paste and Holland House® Marsala Cooking Wine and bring to a simmer. Add the salt, pepper and oregano and stir. Simmer for about 30 minutes and then add the pasta, making sure to stir all the way through. Garnish with lots of fresh basil and fresh grated parmesan cheese.